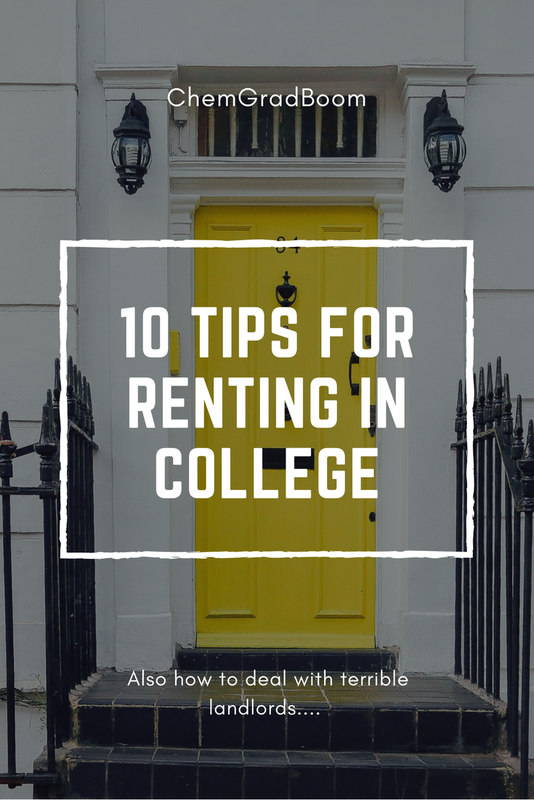 I never thought I would have to write a post about "Renting in College and Bad Landlords" for my college advice section, but after the drama that I have had with my former landlord I need to share my advice to make sure that you will (hopefully) never have the problems that I am having. So here it goes: what to do before you rent, what to do when you move in and what to do to prepare to move out! Plus the most important tip of all and advice on handling a lousy landlord! Make sure to look at more than one or two apartments and look at them IN PERSON. Sure you may have to make a weekend trip to check out places, but the Internet pictures can be deceiving. Seeing a place in person allows you to visualise what it would be like to live there. Can't make a trip up there, see if you can watch a video or Skype with the landlord walking you're virtually through the apartment. Check out the location a few different times during the day. It may be surprising and calm during the day but filled with beer pong/parties at night. Sure the parties are high every now and then but when your studying for an exam, it can be miserable and a distraction. Ask your future neighbours what they think about living there. A lot of times this will get you the honest truth! Read the lease and what it includes. It may be boring but knowing what is written down in the contract can help you if there are ever problems with the apartment. Have proof of what you paid upfront (First, Last and Deposit). This will save you time in the end if there are issues when your lease is up, the landlord may want you to pay your last month's rent even though you paid it. Having proof will save you money and the hassle! The first day the apartment is yours before you have stuff in there do a walk through and take pictures/video documenting the condition of the apartment. Write down anything that you notice is damaged/needs to be fixed and give a copy of the list to your landlord. Notify your landlord in writing of when you plan to move out, try to do this at least a month before your lease is ending. Once your all moved out, do another walk through and document (photos/video) of how you are leaving the apartment. Leave your landlord a forwarding address to get your security deposit and ask when you should expect to get this. Make sure to also get a copy of the landlord's information (if you don't already have it) including name, address, phone number and email if possible. Make sure to get EVERYTHING IN WRITING and keep this together , make a folder with all of this information the day you sign the lease. In the end if your tenancy ends with no issues than having this information won't matter. But if you do have problems with your landlord, having all the information in writing and documented will help your case! Make sure to check out the laws and rights that you have as a tenant. I used NOLO that broke down information by each state and then gave where to look for further information. Contact your landlord in writing with any issues that the apartment has and make sure to follow-up with them until it is fixed. If the problem is never handled than see what you can do to either get out of the lease and move or in extreme cases withhold rent. 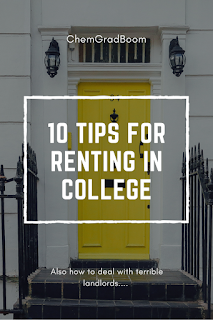 Talk to your college to get advice on how to handle off-campus housing problems. They may have a list of people that can help you to fix the situation and they may also be able to warn others about the apartment and its issues. Contact a lawyer. If you have exhausted all of your other options and are still having issues (apartment conditions/no return of security deposit) you most likely have a case for small claims court. Sure this will be a pain, but it may be the only way to solve the situation. Hope that this helps everyone out there looking to find their perfect place for the start of the school year! Anyone else have advice on how to find the right apartment? Has anyone else ever had issues with their landlords?